When entering retirement, the question of how to structure income can be the most influential factor in determining a family’s long-term financial well-being. Several factors such as income source, inflation, and sequence of returns present risks and opportunities for retirees. Today’s Atheneum discusses how we might explore retirement income with John and Jane Smith. They are considering a fixed Single Premium Immediate Annuity (SPIA) and when to start taking Social Security. We will review how each decision would impact their Monte Carlo simulation – a technique used to understand the impact of risk and uncertainty in forecasting future results. As we met with John and Jane, we wanted to explore two questions. First, we wanted to know how purchasing a SPIA would affect their long-term plan. 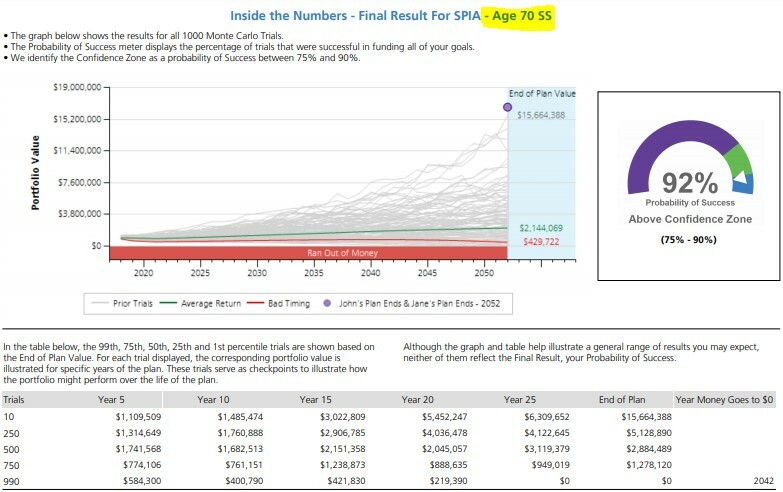 Ignoring the psychological impacts of having “fixed” income, how would a SPIA affect the probability of them accomplishing their goals over their lifetime. Secondly, we wanted to explore when they should take Social Security. Ignoring the break-even analysis, what increases the probability that they do not run out of money before they die? When we analyze the difference between these two scenarios, we come to realize that the result looks relatively similar. In both simulations, the worst-case sequence of investment returns results in John and Jane running out of money in year 2037. From a risk adverse standpoint, if this scenario came to fruition, it would obviously be much more beneficial to have purchased the annuity and had the additional $15,000/year at that time. However, from an average annual return standpoint (which we all know is impossible) the fully invested portfolio’s median analysis ends with an additional $821,488. This attributes to an additional 3% probability of reaching the clients’ income goals. See the charts below. The Monte Carlo Simulation would lead us to believe that the SPIA would only be beneficial if the client experienced one of only a handful of the worst sequence of returns during their retirement years. A general break-even analysis of the impact of taking Social Security at age 66 vs. 70 would lead us to believe that it would only be better to take Social Security at age 70 if someone believes they will live past their early 80’s. In other words, someone would need to live past age 83 to obtain more money from Social Security if they take the income at age 70 rather than age 66. While this is an important perspective, we like to consider Social Security in relation to our Monte Carlo Simulations, as well. Delaying Social Security from 66 to age 70 will increase the annual benefit by 32% (8% increase for each year of delay). Generally, in a normal market environment, delaying Social Security from 66 to age 70 can help reduce sequence of returns risk due to less reliance on market-based income. In the scenario described above, John and Jane took Social Security at their Full Retirement Age. We also ran a scenario to analyze how their probabilities would change if we delayed Social Security until age 70. Below are the results, holding everything else constant. Delaying the Social Security to age 70 not only increased their probability of achieving their goals by 10%+ but it also extended their earliest year of running out of money by five years in their worst period of investment returns. 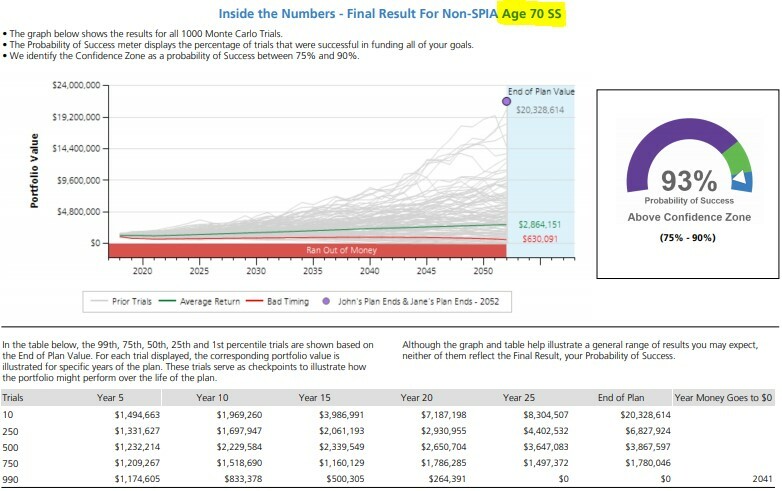 We are sharing these analyses not to provide blanket advice that everyone should delay Social Security to age 70 or be fully invested in the market. Rather, we believe that each one of these decisions should be analyzed concurrently with one’s entire financial scenario and goals in mind. Additionally, we believe all these decisions should be tested with a long-term perspective being taken. 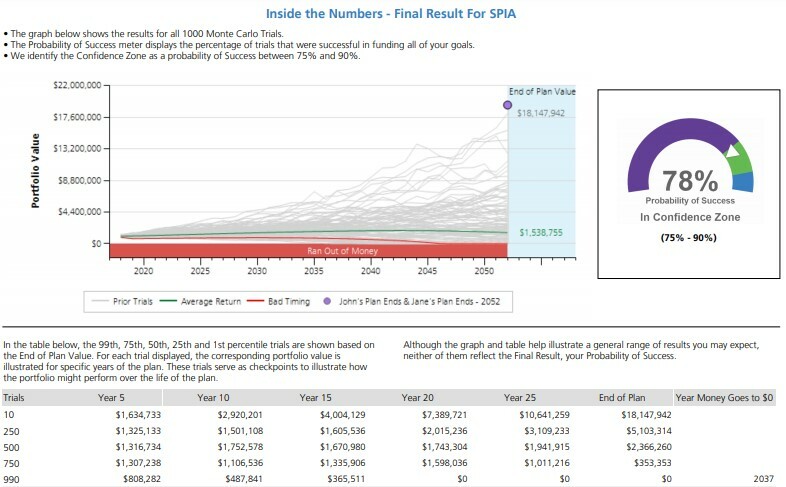 A Monte Carlo Simulation is only one tool that we use when helping clients construct their retirement income and test the plan. This is very much a soft science and investor psychology plays an important role in the conversation as well. If you believe there is someone in your life who we could help or if it has been a while since we have updated your Monte Carlo analysis, please do not hesitate to reach out to our office. We are always happy to help.